The mysterious Himalayan Kingdom of Bhutan is known colloquially as the ‘Land of the Thunder Dragon’. The trek is a brilliant way to interact with the country and its people while enjoying the infrastructure and unique culture and hospitality. While the bike trails of Bhutan are the inspiration, the essence of this journey is to experience a timeless insight into a refreshingly wholesome Himalayan kingdom. While the bike trails of Bhutan are the inspiration, the essence of this journey is to experience a timeless insight into a refreshingly wholesome Himalayan Kingdom. No reviews yet for this trip. Browse other reviews below for Adventure Consultants. We meet in Bangkok at the Novotel Airport Hotel for an orientation and bike check at 7.00pm today. We will go over packaging of your bike and sort out any gear problems you may have. Depart from Bangkok this morning on the Druk Air flight to Paro, Bhutan. If the weather is clear, you may see Kanchenjunga, Mt. Everest and Chomolhari, Bhutan’s sacred mountain. Upon arrival in Paro and completing visa formalities, we will be met at the airport by our local tour guides and accompanied to our hotel, the beautifully crafted new Zhiwa Ling Hotel. After assembling our bikes we can spend half a day biking to places of interest in the Paro Valley, starting with the Ta Dzong, a 17th century monument, which now houses the National Museum and then the Ugyen Pelri, a small jewel like palace belonging to the Royal Family of Bhutan. Along the way we’ll pass one of the innumerable archery grounds. Archery is the national sport of Bhutan and most men grow up learning the sport. If we are lucky, we may catch a match in action. We leave Paro this morning on our bikes and follow the winding road beside the Pa Chu (chu means river or water) to its confluence with the Thimphu River and onto the Nation’s capital, Thimphu and our hotel. After checking in and refreshing ourselves, we will head out to do some sightseeing and there is the chance to do a ride into the upper reaches of the valley also. Because a dress code is necessary to be observed in some of the areas in Thimphu, we will continue with our sightseeing programme by vehicle. The first stop will be a visit to the Dechenphodrang Monastic School, which was the original site of the Thimphu Dzong and is now the State Monastic School. The National Library will also prove to be an interesting stop, as will the Jigmie Dorji Memorial Chorten; a beautiful monument erected in memory of the late King. Many religious ceremonies and gatherings take place here throughout the year. The evening is free to explore the streets of Thimphu. We will have an early start today for a full day biking to the ancient winter capital of Punakha. The full distance covered biking on the highway will be approximately 80 kms/50 miles. It is about 25 kms/15.5 miles to reach the pass of Dochu La (La means pass) at an altitude of 3,048m/10,000ft. In good weather many of the Bhutanese Himalayan summits are in view. Until the pass it is uphill all the way. After stopping for lunch and the view, we continue travelling down to the Punakha Valley below at an altitude of 1,372m/4,500ft. It is downhill all the way from the pass with amazing scenery as the valley is the richest agricultural region of Bhutan. The Punakha Dzong built in 1637 by Shabdrung is situated at the confluence of the ‘Po’ and ‘Mo’ chus (Father and Mother rivers) guarding the Southern end of the Punakha valley. This huge fortress/Monastery was the capital of Bhutan until 1966. The 21 kms/13 miles between Punakha to Wangdhi is a relatively flat cycle. The impressive Wangdhi Dzong reaches skyward from a strategic spur at the confluence of the Tang and Po Chus, and has a commanding view of the valley below. Like all Dzongs, it has a section for the monks and another for the secular authorities. After Wangdhi, the road climbs steadily passing through semi tropical vegetation – banana plants and cactus to pine forests, and then to an alpine environment home to rhododendrons and dwarf bamboo. As we near the Pele La, we will take a detour onto a side road (‘completed’ in the late 80’s) which leads us to the valley of Phobjikha. With a combination of biking and riding on the tour bus, we will plan on reaching our destination before dark. Considered one of the most beautiful valleys in Bhutan, it is encircled by pine forests. In the centre of the valley, rising from a small ridge stands one of the oldest private monasteries in Bhutan – Gangtey Gompa. We will have the opportunity to visit the courtyard of the monastery. The head lama of Gangtey Gompa is the ninth incarnation of the body of Pemalingpa - the famous 14th century black smith from Bumthang who is one of Bhutan’s most famous Buddhist saints and teachers. The area is equally famous as the winter home to the very rare Black Necked Crane. Experts estimate that fewer than 800 cranes exist in the wild. The Cranes arrive in November and stay through March. A short bike ride from the monastery will take us down valley to our accommodation for the evening, which is the rather plush Dewachen Hotel. Again with a combination of partly biking and riding on the tour bus, we head for Bumthang. Distance covered will be approximately 160 km. We return to the main road and then climb up Pele La (3300m/10,825ft). On the way to Tongsa, we will stop for lunch at the Chendibji Chorten, an ancient shrine built on the old walking path across the country. The first sight of Tongsa Dzong, the largest in Bhutan, appears across the valley, but the road winds another 20 kms/12.4 miles before reaching Tongsa. We will have a chance to explore the shops of Tongsa, before continuing onto Jakar in Bumthang. A full day’s biking tour of the Bumthang Chokor Valley, noted as one of the most beautiful and sacred in Bhutan. This valley has a history hallowed by the frequent visits of Padmasambhava when he was bringing the Buddha’s message to Bhutan. He meditated in caves around the valley which now have temples and shrines associated with them. The valley is wide, filled with fields and village folk busy with their day’s work. We will visit Kurje, a 17th century temple next to which a spectacular new monastery is being built in traditional style. In the late afternoon, there will be time to visit the shops which line the single main street here, famous for some of the fabrics singular to the Bumthang District. Today we will bike to the highest of the four valleys which make up the Bumthang Valley. From the Tang Valley, the road gradually climbs through the scenic country side to Ura La (3,408m/11,180ft) which is marked by a chorten and mani wall. Just before the pass, if the weather is clear, magnificent views of Bhutan’s highest peaks, Gangkhar Punsum (7,239m/23,750ft) can be seen. The village of Ura, unlike most Bhutanese villages is made up of closely clustered houses centred around a new temple recently dedicated to Guru Rimpoche. From Ura we will bike on the recently constructed road leading up to the neighbouring village of Shingkhar. This beautiful village is entered around an old temple and manor house that hosts the annual Shingkhar festival. After a packed lunch and a walk through the village, we can visit the manor house to observe rural Bhutanese life. By late afternoon, we will head back to Jakar by a combination of riding and travel on our accompanying bus. The aim is to make a full day’s biking tour of the Tang Valley. We will stop at several important religious pilgrimage sites including Mebartsho, -‘the burning lake’ and Tang Rimochen Lhakhang. One track leads up to the base of Ugyencholing Dzong. The valley is named after this lordly residence, which dominates the valley and is one of the most important ancestral manor houses in Bhutan. It is a short walk up to the Dzong from the point we can bike to. After a picnic lunch and a walk through the surrounding village, we will bike back to our guesthouse in Jakar. The distance from Jakar to Ugyen Choling is approximately 35 kms/21.7 miles. Today again we will be partly biking and riding on the tour bus. Distance covered will be 190 kms/118 miles approximately. We return over the Pele La (for the longest downhill of the trip!) and stay at the Chuzom Sa Resort. We are planning on an early morning departure to visit the Punakha Dzong and then travel over the Dochu La for a chance to view the Bhutanese Himalayas. In the early afternoon, we will return to Thimphu. The rest of the day is free to roam Thimphu for sightseeing, shopping or more riding, or we can visit at the Thimphu Dzong. Today we transfer back to Paro and then drive the winding road beside the Pa Chu to Satsam Chorten. From this point, we begin the challenging hike to Taktsang, the Tiger’s Nest. A vantage point directly across a gorge from the temple can be reached in about four hours. 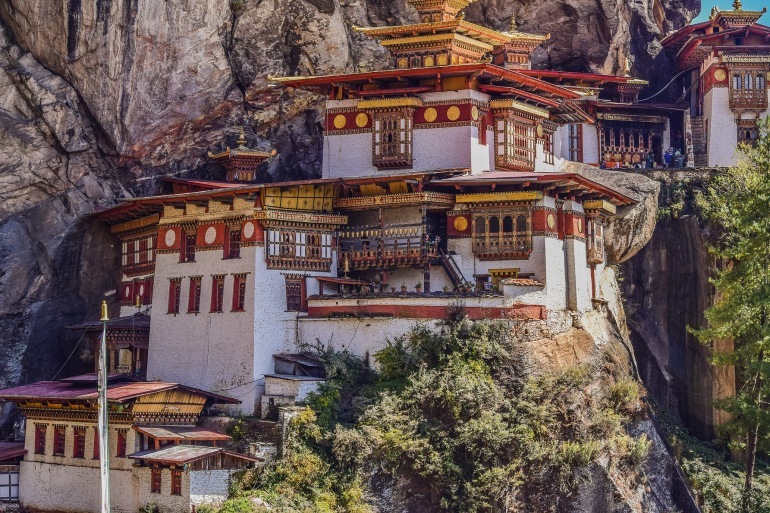 This magical monastery clings to a vertical granite cliff 61m/200ft above the valley floor. Legend says that Guru Padmasambhava flew here on the back of a tiger to meditate. The tiger was actually his favourite consort, Yeshe Tshogyel, whom he transformed in to a flying tiger for the purposes of this journey. They meditated in the cave and when the Guru left he instructed that the monastery be built. With a relaxing of the restrictions, which were in effect until January of 1991, we may be allowed to enter Taktsang. If so, it must be noted that it is one of the most holy and revered pilgrimage sites in Bhutan. Our behaviour within the temple complex will have a direct impact on future permissions to enter the area. The temple tour guide will notify us of the appropriate behaviour. Tonight we will have a farewell dinner together as we enjoy our last evening in Bhutan. After breakfast, we return to the airport for our departure from the land of the Thunder Dragon for Bangkok on Druk Air, and then onward travel home. Purchases of bottled water while on the trip, gifts or alcohol. We recommend that you bring a mountain bike that you are familiar with, i.e. not too new. The bike should at least have front suspension, but full suspension is not a necessity either. As the trip crosses several high altitude passes, your bike should be suitable for sustained climbing. Tyres suitable for riding on hard packed, off road conditions, are recommended. It is very important that your bike is in excellent running order before the trip. If you have servicing work done before leaving for Bhutan, make sure you have ridden your bike several times before departure, ensuring everything is working as it should be. We will be carrying tools and some spare parts for roadside repairs. Do not expect to be able to purchase any bicycle products while in Bhutan. If you are bringing a mountain bike with 29 inch wheels, please let us know this when booking your trip. A list detailing all the necessary clothing and equipment trip members need to bring will be sent to you upon receiving your booking confirmation. If you have any queries about items on the list please do ask, as we can help you source any items you are missing or needing to upgrade with our retail service. Food will be of the highest standard possible, given the remoteness of the situation, but please rest assured that the standard of lodging in Bhutan is in fact very high. Breakfast and dinner will be buffet style meals in the Bhutanese lodges, and lunches will be taken in villages along the way or a daily packed lunch. Please inform us if you have any special dietary requirements. As mentioned, the standard of the lodges and hotels that we will stay at is very good, for when travelling in this Himalayan Mountain Kingdom. Rooms will be on a twin or dormitory share basis, and you will not need to bring a sleeping bag as linen is supplied.